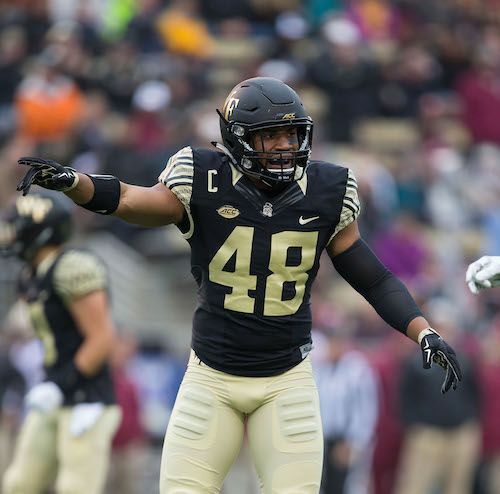 Former Wake Forest football star Brandon Chubb (’15) is looking forward to celebrating his birthday Saturday with four second-graders in Atlanta. But he’s not expecting any gifts; instead he’s giving them one. Chubb, an All-ACC linebacker now with the Detroit Lions, is taking the underprivileged kids to the Wake Forest-Georgia Tech game in Bobby Dodd Stadium. It’s the first event for his newly formed Chubb Foundation that will focus on helping and inspiring children in the Atlanta area. Combining football, Wake Forest and the Atlanta area where he grew up seemed like the perfect way to kick off his foundation. That it’s all happening on his birthday will make the day even better. Indeed he has. At Wake Forest, he built houses for Habitat for Humanity; dressed as Santa Claus to deliver Christmas gifts with Santa’s Helpers; and volunteered every Sunday during the offseason packaging and delivering food to impoverished neighborhoods through the HOPE program (Help Our Children Eat). HOPE was so important to him that when he returned to campus for the spring football game last April, he took his fiancée to visit the organization. He picked up not one, but two awards for his service: the ACC Top Six for Service Award and the Pop Warner College Football Award. After graduating with a degree in economics, Chubb signed as a free agent with the Los Angeles Rams in 2016. Since then, he’s bounced between Los Angeles, Detroit, San Francisco and back to Detroit. He’s back home in Georgia now on injured reserve. With plenty of time on his hands while he rehabs, he thought the time was right to start his foundation. “This was the next step in my life, to give back,” he said. Chubb comes from a far-from-average football family. His father, Aaron, was a linebacker at Georgia who was drafted by the Patriots in the 12th round of the 1989 NFL Draft. Younger brother Bradley is a standout defensive end at N.C. State. Cousin Nick is a record-breaking running back at Georgia. Chubb hopes his brother and cousin — both sure to be high NFL picks — will join him in the foundation’s work once they’ve graduated. 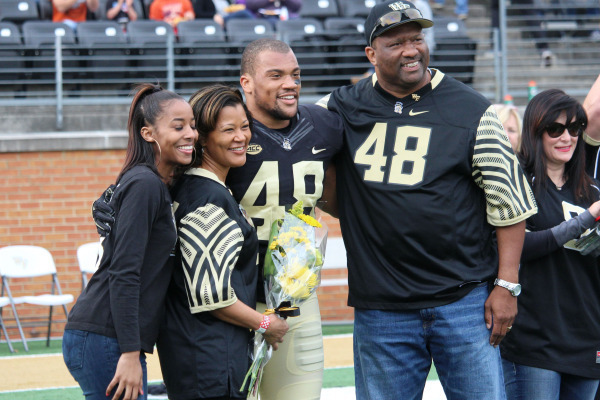 Brandon Chubb and his parents on Senior Day 2015. Chubb, who once said he wanted to be the first NFL player in outer space, incorporates a rocket man in the Chubb Foundation’s logo. (Chubb is interning with NASA for a month in the off season through a program sponsored by the NFL Players Association.) “This is only the first of many efforts our organization will give back to the community and youth within the following weeks, months and years to come,” he wrote on the foundation’s Instagram page. 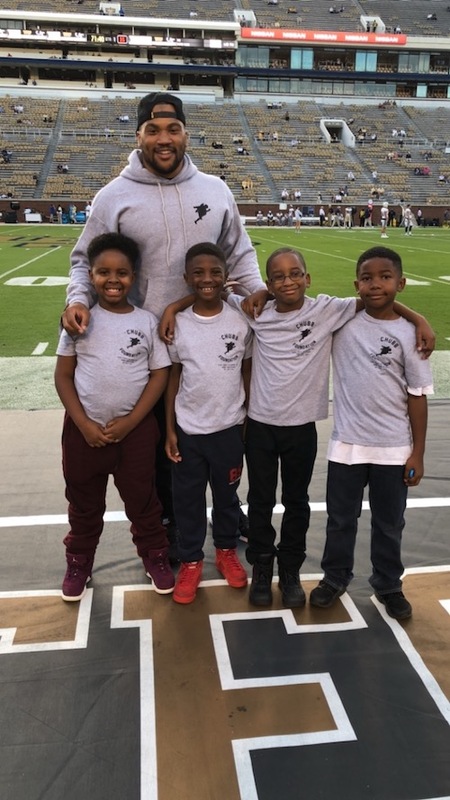 Brandon Chubb and students at the Wake Forest-Georgia Tech game.